Eager to get on the road and experience the RV lifestyle but can’t afford a heavy-duty pickup to tow a travel trailer with? You may be wondering about the real towing capacity of a light-duty truck like the Ford F-150. Could an F-150 be a good option for towing a travel trailer. And if so, what size travel trailer should you be shooting for? Most – but not all – F-150 models can safely pull a travel trailer that’s under 6,000 lbs (with gear). Have you heard higher figures thrown around by a salesperson? Don’t be fooled. In theory, an F-150 with supercrew cab (i.e. heavier and longer) and a Max. Trailer Tow Package, has a maximum towing capacity of 13,200 lbs. However that would mean towing with an empty truck – with no passengers (other than the driver) or any gear. The Ford F-150 – magnificent as it is – has limited real towing capacity. If you’re planning on getting a trailer that weighs over 6,000 lbs (gear included), you should consider getting a larger truck. Well, it really isn’t. It’s about the F-150 range of trucks, also known as lightweight or half-ton trucks. In short, a half ton truck is one that can take on a payload of approximately half a ton. And as I explained here, payload has a direct effect on towing. And just as a side note, these days half-ton trucks have higher payloads that go beyond the half ton point. Payload is about how much you can load on the truck itself – regardless of towing. So why would it even be relevant to the weight of the trailer? For two reasons: the issue of tongue weight and the issue of your total weight (truck, hitch and trailer). Tongue weight is the amount of pressure (weight) the hitch puts on your F-150 truck (or any other towing vehicle). Clearly, that amount of pressure will depend on how much weight you’re towing as well as weight distribution within the trailer. The more weight there is and the more of that weight is in the front of the trailer (closer to the hitch) the more tongue weight you have. Tongue weight is a good thing – to a degree. It’s good because it makes your entire setup much more stable. Driving with a trailer that’s too light or one that has too much of the weight in its back could mean you’re not getting enough tongue weight. That is a major reason for sway – the greatest fear of anyone towing a trailer. Read more about tongue weight and how to measure it in my post about towing capacity. In order to tow safely, Ford recommends a tongue weight of 10%-15% of the overall trailer weight (that’s trailer + gear). Experienced RV’ers suggest sticking to the 12%-15% range for a safer towing experience. The question is – is 12% of your trailer weight (your optimal tongue weight) something that can be easily factored into your payload? With an average payload of around 2,000, and assuming you need at least 1,000 lbs for passengers and gear, that leaves you only 1,000 lbs for your tongue weight before you exceed your overall payload. If that’s 12% of your trailer weight, we’re already talking about a limit of 8,333 in trailer weight, regardless of your suggested towing capacity “on paper”. We’ll get back to tongue weight and payload later on, as we look at the actual specs of various Ford F-150 models. The Gross Vehicle Weight is the measurement which takes into account everything that you get on the road. That’s your truck’s dry weight + actual payload + hitch + trailer. In the end, that number should not exceed your Gross Vehicle Weight Rating, or GVWR. Naturally, the larger trucks can tow more. 3/4 ton and 1 ton pickups are what’s known as heavy duty trucks. These beasts of vehicles were made to take on heavy weights, both in carrying capacity (payload) and in towing a trailer. Higher classes and payloads are made possible by heavier frames and stronger suspensions, brakes, engines, or a combination thereof. This beefier construction helps a lot in towing a trailer as well, with tow ratings that easily outperform the lesser light-duty pickups. That’s why an F-450 or a Chevy Silverado 3500HD are heavy duty trucks. Not only do they have a higher payload, they can also tow heavier loads. That doesn’t mean the half-ton or lightweight trucks can’t tow a travel trailer. They certainly can. And in order to get some real-life figures, we’re going to take the F-150 and see just how much it can actually tow when a travel trailer is concerned. And remember – we’re talking about travel trailers. Not 5th wheels, not a boat, not a u-haul with boxes. A travel trailer or camper. The truck gets to do the heavy lifting with its bed – just as it was designed to do. In windy conditions, the 5th wheel is very securely attached to the truck so there’s a lot less sway. This is why the same truck can tow a heavier 5th wheel then a trailer. In the manufacturer’s charts, you’ll see that gooseneck towing (i.e. 5th wheel) gets higher maximum weight towing ratings than just trailer towing. So, what’s the real towing capacity of an F-150? Ford takes pride in the F-150 being “Best in Class” where it comes to towing capacity. But just how much can an F-150 pull? Basically, the XL is the most basic model while the Limited edition comes with all possible bells and whistles. The rest offer combinations of systems and features, either as standard or optional. The Raptor is up the with the Platinum and Limited but has better offroad abilities (including a more powerful engine). Let’s look into each one in more depth. The stronger the engine, the higher the towing capacity. A stronger engine provides more horsepower and – more specifically – more torque. There are several types and sizes of engines available in the F-150. The strongest one is the 3.5L V6 engine with ecoboost. This is a powerful gas-driven engine that generates 375 HP at 5,000 rpm. Even more importantly for towing, it can generate torque of 470 lb.-ft. @ 3,500 rpm. That is actually more torque than an F-250 generates with its 6.2L V8 engine! Note that this is the standard engine of the F-150 Platinum and Raptor but not the other F-150 models! You can absolutely buy even an F-150 XL with the 3.5L V8 ecoboost engine but it’s optional for all other models other than the Limited or Raptor. In fact, in a Raptor, you have the High Output version of this engine for even more torque. The Raptor’s High Output 3.5L EcoBoost V6 generates staggering torque of 510 lb.-ft. @ 3,500 rpm and a total of 450 horsepower! Which is great for its off-road abilities. Axle ratio is very important for providing torque. And torque matters when you’re towing. Torque is the force that gets the wheels of your trailer (and your truck) moving when the light changes from red to green. Once in motion and at full speed, torque doesn’t really matter anymore, until you need to brake using the force of your engine. Anyway, let me give you the “axle ratio for dummies” explanation. So, the engine creates energy. That energy makes the driveshaft rotate very fast. The energy from the driveshaft is then sent to the axle (either one or two – depending if have a 2WD or 4WD). What the axle does is determine how many times the wheels will actually turn using that energy. The slower they’ll turn – the more energy goes into every turn and the stronger the pull of the truck. The faster they go, then the less energy is put into each turn of the wheel. If you’re hauling/towing a relatively small weight on the road, faster movement at the same energy investment will get you rolling faster with less fuel. That’s a good thing! However, if you’re towing or hauling a heavy weight, you need the wheels to move just a little bit slower and use that excess force to pull more weight. The number of the axles ratio looks something like 3.15. That’s the number of times the driveshaft turns for each single turn of the wheel. The higher the number, the slower the movement and the more force goes into each turn of the wheel. Or in other words, for towing – you want a higher axle ratio. For fuel economy (when not towing) a lower axle ratio is better. Actually, make that length and weight of truck vis a vis length and weight of trailer. We’re talking very simple newtonian physics here. When you have a towing vehicle and a towable hitched together, they’re going to affect each other. The faster you go, the stronger the effect. Making a turn or driving through wind is when you might get into trouble. Since you’re in control of the towing vehicle’s behavior, you basically want that vehicle to “take the lead” as far as the forces of physics are concerned. That means that for maximum control, you need the towing truck to be as heavy and as long as possible. Imagine a huge heavy truck towing a lightweight small towable. Clearly, if there’s sway, it’s the towable that’s going to take the brunt of it. The truck will remain stable. On the other hand, imagine a super heavy long trailer, towed by a small lightweight truck. In this unlikely scenario, any sway from wind or from just about anything else, could easily throw the towing vehicle out of course. And once that happens and the driver loses control, the towable follows. Bad, bad situation and why you should never pull above your towing capacity. In a pickup truck, the weight of the truck that matters for towing purposes is the GCWR or “gross combined weight rating”. Basically, that’s how much weight your truck can take in payload and its own weight. As for the length of the truck, it’s a question of the type of truck cab plus the length of the bed (box). King Ranch, Platinum and Limited models are available only with crew cab, making them by definition the longer of the F-150 trucks. They also have longer beds by default. Having said that, you can definitely order a basic F-150 XLT with a crew cab and a long 8ft bed. Yes, back to payload again! Remember the tongue weight that we discussed earlier in the post? Now it’s time to bring it all together. Payload is the total maximum weight of the driver, passengers, gear and a full tank of gas. In other words, the amount that you can put on your truck (regardless of towing) on top of the truck’s own dry weight. When you’re weighing the amount of pressure your trailer hitch puts on the truck, that number should go into the overall payload capacity. For example, let’s say your tongue weight is 450lbs. If your truck’s payload is 1000lbs then you only have 550lbs left to load the truck. That 550 lbs is what you have now for the driver, passengers and gear. If you go over that, then you exceed your overall payload because of the tongue weight. Reducing weight is an effective way to increase payload. And that’s what resulted from cutting the weight of the F-150 body with high-strength, military-grade, aluminum alloy. Greater strength with less weight helps achieve a best-in-class* payload rating in F-150 models. It varies quite significantly. What’s more, you can get payload packages that add to your payload in almost every model. An F-150 truck with those specs has a payload of 1,680lbs. With these specs, your F-150 payload is going to be 3,270lbs. As you can see, that’s almost double the payload. Which means you get more room in terms of adding heavier tongue weight and consequently, a heavier trailer. Last, but certainly not least, we have the towing package. What’s a Ford Towing Package? 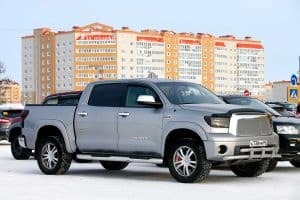 Essentially, it’s an enhancement of the truck that includes the towing hitch itself, as well as several elements which increase towing capacity as well as ease of towing. 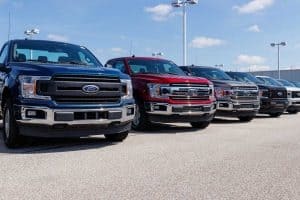 For offers several types of towing packages for the F-150 trucks, the basic ones are included in some of the models “off the shelf” but most need to be pre-ordered. Let’s take a look at what these packages include and what they provide you with. This is Ford’s basic towing package. It’s included as a standard feature in the Lariat, King Ranch, Platinum and Limited models and it’s optional in the XL and XLT. This is an upgrade to the Class IV package, adding an auxiliary transmission oil cooler and an upgraded front stabilizer bar. This package is a standard feature in the Raptor model and optional in others. electronic-locking rear axle or an 3.73 one if you also have the Heavy-Duty Payload Package. Engine, axle ratio, truck weight and length and the towing package. If you look at the very detailed brochure of the F-150, you’ll see that there’s a big long table for towing capacity. Let’s make things a bit easier. On the low end, an F-150 Lariat, with a 3.3L Ti-VCT V6 engine generating just 290 horsepower and 265 torque, with a regular bed and short cab, is limited to the 5,000 maximum towing range. That’s not much if you want to pull an RV behind you. On the other side of the spectrum, the same Lariat with the 3.5L V6 Ecoboost engine generating 375 hp and 470 torque, with a SuperCrew cab and a longer bed – along with a robust towing package – can tow over 10,000 lbs. But remember payload and tongue weight! If you plan on loading the truck itself with even more heavy gear, you’ll be eating into your payload capacity. Which could dramatically decrease your range of towing capacity. Measure your tongue weight and make sure to keep it between 12% and 15% of your trailer weight. In some F-150 models – mostly the heavier 4WD – that could significantly limit your towing capacity. Also, the one rule of thumb everyone keeps repeating is to tow under your maximum towing limit. It’s just so much safer and reduces sway issues, especially with a light-duty truck as your towing vehicle. Which is why with most F-150 models a good weight for towing would be in the 6,000 lbs range and no more than that. With some configurations, you can push that limit up to the 8,000 lbs range but probably shouldn’t. This post is getting too long, so I’ll wrap it up now. I’m going to write a separate post reviewing the kind of trailers that are actually in the 5K lbs range, just to get a feel of what kind of travel trailer RV’s we’re talking about – even when towing with one of the more basic F-150’s. Maximum loaded trailer weights shown. Do not exceed trailer weight of 5,000 lbs. when towing with bumper only. The combined weight of the towing vehicle (including options, hitch, passengers and cargo) and the loaded trailer must not exceed the GCWR (Gross Combination Weight Rating). Trailer tongue load weight should be 10-15% of total loaded trailer weight. Make sure that the vehicle payload (reduced by option weight) will accommodate trailer tongue load weight and the weight of passengers and cargo added to the towing vehicle. The addition of trailer tongue load weight, and the weight of passengers and cargo, cannot cause vehicle weights to exceed the rear GAWR (Gross Axle Weight Rating) or GVWR (Gross Vehicle Weight Rating). These ratings can be found on the vehicle’s Safety Compliance Certification Label. That’s a lot of text in small-print so I hope the way I explained in this post helps. If you found this post helpful please share it around! There are many new owners of Ford F-150 out there and it’s good to spread the message about safe towing. And if you own a light-duty truck and used it for towing, I’d love to hear about your own experience too. Just leave me a comment below. Next PostWhat’s a Dually Truck (And Do You Need One to Tow a Travel Trailer)? Thank you for the informative article. That being said I pull a sportster 301thr with my f150 xlr super crew. It has the max tow package as well. I also haul 2 800 lb Harleys in the trailer. I have a husky centerline weight distribution hitch . The truck has no problem with handling or pulling whatsoever. My tongue weight dry is 1300lbs and I dont usually put much of anything in the bed. My nearest calculations put my trailers loaded weight at about 10500lbs. I wouldn’t really want to go beyond that. Thank you for your comment! Much appreciated! 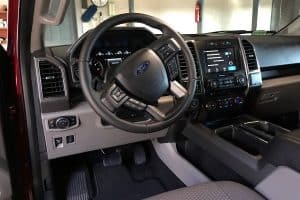 I guess a lot depends on your level of comfort and experience and possibly on the type of roads you’re driving – this is great input, nothing quite like hands-on experience! I’ve spent the last two weeks on the net and talking to TT dealers trying to learn this stuff and this post is by far the best advice I’ve found so far. The TT dealers don’t even seem to know this stuff! Thanks. So glad to hear this! Hope you can find the right travel trailer for your truck! So glad I found your article.I have 2018 F150 2.7 v6 ecocboost supercrew 2wd sb with 3.15 axle.I have a 7way connector,class IV hitch,smart trailer tow and trailer brake.My truck has 6350 GVWR and 1710 payload,that matches every chart I have seen.My tongue weight is 10.5 percent.Have a weight disbursement hitch.Going to tow a travel trailer at 5500 lb. with cargo in it. Its rating is 6000lb. 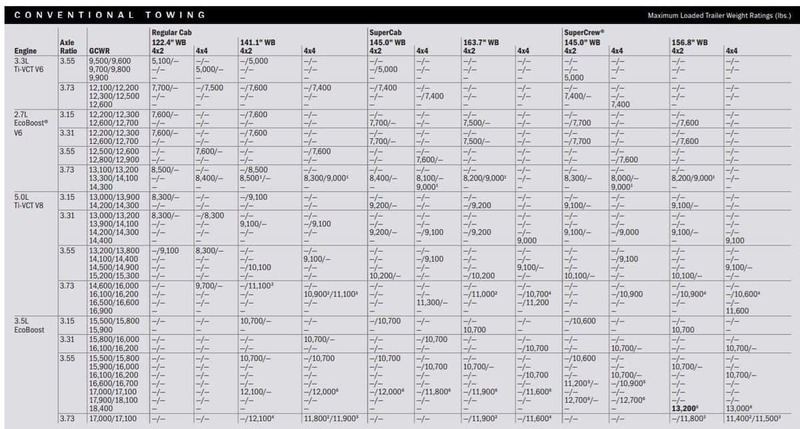 Keeping 500lb under weight.And stay below payload weight.Your published chart Im ok and do not want to push it any higher.But here is the issue.The 2018 Ford tow guide does not list my truck axle.there is no 3.15 axle with my engine.If you look at the 2017 Ford Tow Guide my axle is listed and its tow capacity is 7600/7700.The GCVR is 12700 same as last year.Dealer tells me 7700 capacity for 2018.Actually spoke to a Ford product engineer in Detroit yesterday. She did not realize my engine/axle ratio was not on the chart.said it should be the same.Told me the only difference was cosmetics and paint choice, yet nothing confirmed.Am I ok? My 2018 F150 2.7 v6 supercrew 2wd sb 3:15 axle.Does not appear on the 2018 ford tow vehicle chart.My truck and engine are there but not 3:15 axle. The 2017 Ford tow guide shows my truck with the 3:15 axle.Capacity at 7700.I can find all the other data.6350GVWR 1710 payload I have class IV hitch,7 pin harness,smart tow connector and trailer brake.Looks everything is the same,only question is tow capacity.Iwant to tow a travel trailer @5500 lb.that is with cargo and 500 lb. below its 6000 gross. I think it’s fantastic that you’re making such an effort to get a solid answer. I think you did the right thing to contact Ford about this but what I would do next is contact them in writing – not over the phone – stressing the engine/axle numbers. I don’t know whether that reduces – or possibly increases – your towing capability but since you’re cutting it fairly close with those 500lbs, I would want to see Ford’s answer in writing first. Let us know what they said and good luck! 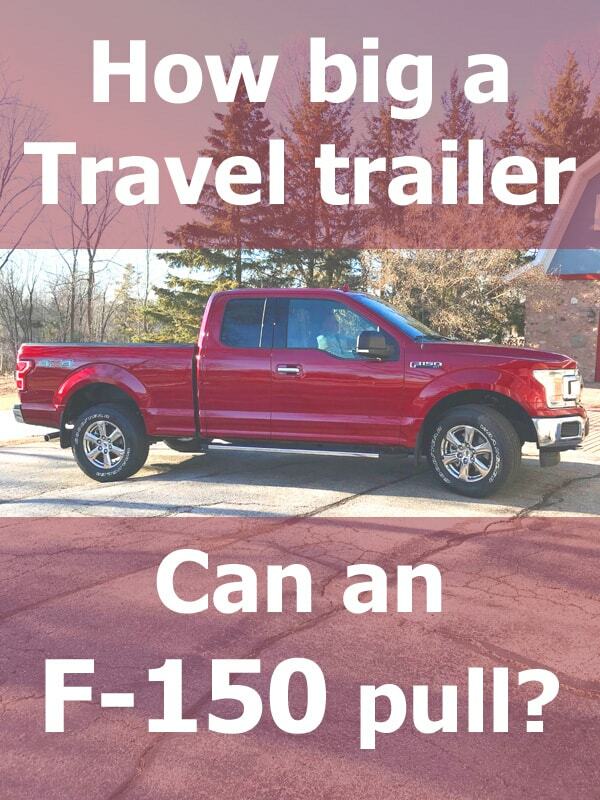 Can you provide the link to the article that shows which common travel trailers can be towed with the F150?? Hi Lisa, I’m not sure which article you’re asking about but we have this guide about lightweight travel trailers. In most cases, these should all be a good fit for an F150. varies a lot with slide outs and other configurations. I have a 29 ft Jay Flight that has one small slide out and is around 7,500 loaded. There are 25 ft trailers that weight more with multiple large slide outs. I’m so glad you liked the post. I assume you’re asking about moving from a 5th wheel hitch to a gooseneck? I can see the appeal. That would also free up a lot of room in your bed. I tend to agree with you on this being an adequate setup in most driving conditions. Maybe not all though. As always, when in doubt, I suggest emailing Ford and asking them specifically. Best to have a guarantee from one of their engineers. My F150 5.4 Triton long bed is loaded right now with 2.5 tons of cement and cinder block and brick debris. I do demo work in Tijuana Baja California Mex. Did I mention its the 3/4 ton? 7 lugs. Awesome rig! That sticker probably has the right top number. With a truck camper (not a trailer) it’s that payload number that you need to pay attention to. And it’s always best to stay well under the top limit. These posts might help too: Understanding a truck’s payload limits and lightweight truck campers. That’s interesting, Steve. And strange, you’d think the towing rating will take the make of the body into account. Have you tried calling Ford about this? Maybe one of their engineers can help you out with suggestions re the hitch you’re using?